Ultimates 3 #5 page 9. Original pencil art from the great Joe Madureira, one of the best pages during his Ultimates run. Captain America (dressed as Black Panther) finishes off Juggernaut with his shield. Included are Iron Man, Wolverine, Wasp and Ant Man. This page is drawn on half a sheet of 11" x 17" sheet of Bristol board. 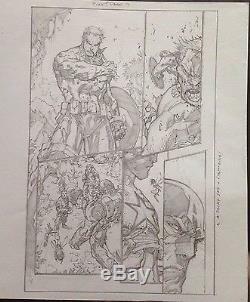 The item "Captain America, Iron Man, Wolverine Joe Madureira original art, Ultimates" is in sale since Tuesday, August 09, 2016. This item is in the category "Collectibles\Comics\Original Comic Art\Other Original Comic Art". The seller is "wolverine220484" and is located in Ballymena. This item can be shipped worldwide.